The aim of the study was to evaluate the threshold of muscle pain sensitivity at the posterior line of the futsal player’s lower extremity muscles under the influence of the stimulation of the foot arch with a nonelastic tape application. The study included 25 futsal players representing university club AZS AWF Wroclaw. During the experiment, a nonelastic tape was applied on the plantar foot surface, basing on the standards of low-Dye taping.The test program consisted of a 3-day cycle, during which the pressure pain threshold (PPT) was measured: 1) before application of the tape, 2) 24 hours and 3) 72 hours after application. The PPT was measured using the Somedic Algometer type 2. Analysis of the results was performed using analysis of variance for repeated measures and post hoc Bonferroni’s test. Long-term stimulation of plantar surface significantly affects the increase in the PPT in the lower extremity posterior line muscles. In motor control trainings, especially in match-starter terms, new physiotherapeutic measures and therapeutic techniques should be used. 1. Andersen H., Arendt-Nielsen L., Danneskiold-Samsoe B., Graven-Nielsen T. Pressure pain sensitivity and hardness along human normal and sensitized muscle. Somatosens Mot Res. 2006; 23: 97–109. 2. Baroni M., Generosi R.A., Pinto Leal Junior E.C. Incidence and factors related to anklesprains in athletes of futsal national teams. Fisioter 2008; 21 (4): 79–88. 3. 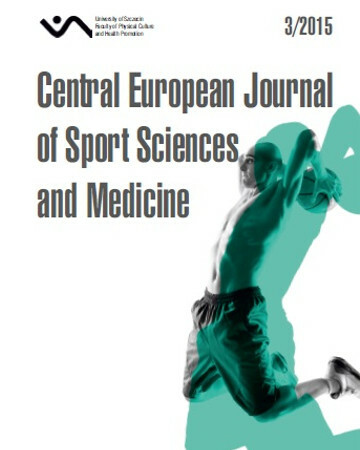 Barbero-Alvarez J.C., D’ottavio S., Granda-Vera J., Castagna C. Aerobic fitness in futsal players of different competitive level. J Strength Cond Res, 2009; 23 (7), 2163–2166. 4. Barbero-Alvarez J.C., Soto VM., Barbero-Alvarez V., Granda-Vera J. Match analysis and heart rate of futsal players during competition. J Sports Sci. 2008; 26 (1): 63–73. 5. Barbieri F., Gobbi L.B., Santiago P.S., Cunha S. Performance comparisons of the kicking of stationary and rolling balls in a futsal context. Sports Biomechanics. 2010; 9 (1): 1–15. 6. Cain L.E., Nicholson L.L., Adams R.D., Burns J.. Foot morphology and foot/ankle injury in indoor football. J Sci Med Sport. 2007; 10 (5): 311–319. 7. De Oliveira Bueno M.J., Caetano F.G., Pereira T.J., De Souza N.M., Moreira G.D, Nakamura F.Y, Cunha S.A, Moura F.A. Analysis of the distance covered by Brazilian professional futsal players during official matches. Sports Biomech. 2014; 13 (3): 230–240. 8. Dogramaci S.N., Watsford M.L., Murphy A.J. Time-motion analysis of international and national level futsal. J Strength Cond Res. 2011; 25 (3), 646–651. 9. Fumich R.M., Alison A.E., Querin G.J., Grace P.D. The measured effect of taping on combined foot and ankle motion before and after exercise. Am J Sports Med. 1981; 9 (3): 165–170. 10. Fromy B., Sigaudo-Roussel D., Saumet J.L. Cutaneous neurovascular interaction involved in tactile sensation. Cardiovasc Hematol Agents Med Chem 2008. 6 (4): 337–342. 11. Ismail S., Adnan R., Sulaiman N. Moderate Effort Instep Kick in Futsal. Pro Eng. 2014; 72: 186–191. 12. Jönhagen S., Ackermann P., Saartok T. Forward lunge: a training study of eccentric exercises of the lower limbs. J Strength Cond Res. 2009; 23 (3): 972–978. 13. Junge A., Dvorak J. Injury risk of playing football in Futsal World Cups. Br J Sport Med. 2010; 44 (15): 1089–1092. 14. Kawczyński A., Mroczek D., Chmura P., Madeleine P., Chmura J. Influence of a professional football game on delayed onset muscle soreness development In dominant and non-dominant legs. Medycyna Sportowa (Polish J Sport Med). 2013; 29 (1): 55–61. 15. Kirkendall D.T., Dvorak J. Effective injury prevention in soccer. Phys Sportsmed. 2010; 38 (1): 147–157. 16. Knapik J.J., Sharp M.A., Canham-Chervak M., Hauret K., Patton J.F., Bruce H.J. Risk factors for training-related injuries among men and women in basic combat training. Med Sci Sports Exerc. 2001; 33: 946–954. 17. Kogler G.F., Veer F.B., Solomonidis S.E., Paul J.P. The influence of medial and lateral placement of orthotic wedges on loading of the plantar aponeurosis. J Bone Joint Surg Am. 1999; 81 (10): 1403–1413. 18. Layne C.S., Forth K.E., Baxter M.F., Houser J.J. Voluntary neuromuscular activation is enhanced when paired with a mechanical stimulus to human plantar soles. Neurosci Lett. 2002; 334 (2): 75–78. 19. Lentell G., Baas B., Lopez D., Mcgure L., Sarrels M., Snyder P. The contributions of proprioceptive deficits, muscle function, and anatomic laxity to functional instability of the ankle. J Orthop Sports Phys Ther. 1995; 21 (4): 206–215. 20. Myers T. The anatomy trains. J Bodyw Mov Ther. 1997; 1 (2): 91–101. 21. Nasiri M., Salehian M.H. Comparison of Flexibility of Pelvic and Femoral Muscles in Futsal, Weightlifting and Swimming. Ann Biologic Res. 2011; 2 (6): 79–83. 22. Nosaka K., Clarkson P.M., McGuiggin M.E., Byrne J.M. Time course of muscle adaptation after high force eccentric exercise. Eur J Appl Physiol Occup Physiol. 1991; 63: 70–76. 23. Radford J.A., Burns J., Buchbinder R., Landorf K.B., Cook C. The effect of low-dye taping on kinematic, kinetic, and electromyographic variables: a systematic review. JOSPT. 2006; 36 (4): 232–241. 24. Ribeiro C.Z.P., Akashi P.M.H., Sacco I.C.N., Pedrinelli A. Relationship between postural changes and injuries of the locomotor system in indoor soccer athletes. Rev Bras Med. Esporte. 2003; 9 (2): 98–103. 25. Ribeiro R.N., Pena Costa L.O. Epidemiologic analysis of injuries occurred during the 15th Brazilian Indoor Soccer (Futsal) Sub20 Team Selection Championship. Rev Bras Med. Esporte. 2006; 12 (1): 1–5. 26. Russo S.J., Chipchase L.S. The effect of low-Dye taping on peak plantar pressures of normal feet during gait. Aust J Physiother. 2001; 47 (4): 239–244. 27. Sandrey M.A. Prevention of Injuries in Excessive Pronators Through Proper Soccer Shoe Fit. J Athl Train. 1996; 31 (3): 231–234. 28. Vicenzino B., McPoil T., Buckland S. Plantar Foot Pressures After the Augmented Low Dye Taping Technique. J Athl Train. 2007; 42 (3): 374–380. 29. Woods C., Hawkins R.D., Maltby S., Hulse M., Thomas A., Hodson A. The Football Association Medical Research Programme: an audit of injuries in professional football – analysis of hamstring injuries. Br J Sports Med. 2004; 38: 36–41.